Stacie Defilio spent two years collecting bottle caps for her piece. A vibrant new piece of art is hanging in a La Peer HealthlSystems outpatient surgery center in Beverly Hills, Calif., created by one of the center’s own nurses to spread positivity. 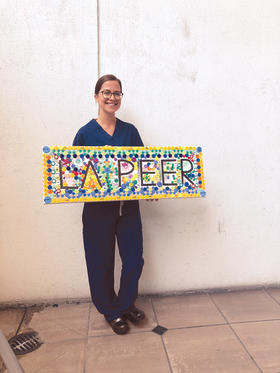 With the help of the center’s anesthesiologists, nurse Stacie Defilio spent almost two years collecting 4,000 medication bottle caps that she fashioned into a mosaic reading, “La Peer,” an idea inspired by another oncology nurse on Pinterest. Defilio’s project inspired some co-workers and friends to start their own projects. A second cap creation already hangs in the same pre-operating room, created by one of the orthopedic surgeons and his daughter.